Room temperature is always a hot topic in the office. No matter what you set the workplace thermostat to, it can seem impossible to please everyone. Someone is always too hot or too cold. Even so, it’s very important to get it right, because research shows that temperature has serious effects on work performance. Turns out, it’s far more than just a comfort issue. So, what is the optimal workplace temperature? Let’s dive into the science to find out. A safe, comfortable work environment is important for employee satisfaction. Considering this, you wouldn’t want employees to use broken equipment or have to sit under a leaky ceiling. And, the same goes for air quality. If your office has poor indoor air quality (IAQ), the employees’ health, productivity and overall comfort will be affected. Here are five things you can do to improve indoor air quality in your office building. For your commercial HVAC system to run at peak efficiency, it needs to be sized just right for your facility. If not, you could face issues, like higher energy bills or temperature fluctuations. Here’s why HVAC system size impacts efficiency and what goes into calculating the size of your HVAC unit. When you run a business and have a commercial HVAC system, it can be hard to keep things cool during the summer. The heat is naturally going to seep in. It’s important to make sure that your HVAC system is working properly so that your employees and customers are comfortable. Read on for some summer HVAC tips that can help prepare you for the warmer weather. 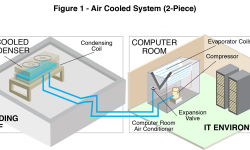 What is an HVAC Economizer? If you are interested in generating energy savings in the home, an HVAC economizer may be the way to go. For most homeowners, saving energy is a necessity and upgrading your HVAC system is a great way to see a significant change in overall energy usage. 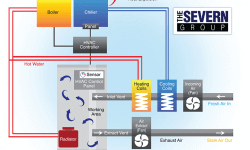 Read on to learn more about the benefits of an HVAC economizer, as well as how it works and where it can be installed. 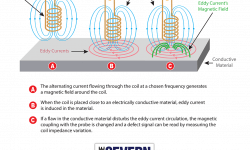 The term Eddy Current Testing (ECT) uses electromagnetic induction to find flaws and cracks in conductive materials. Specifically, ECT is used in the service and manufacturing industries where tubing, sheet metal, and other slim products created from metal are needed for essential operations. With ECT, electromagnetic fields can detect metal hardness and thickness, heat damage, and more. Testing is completed without harming the test material during the process. The term HVAC stands for heating, ventilation and air conditioning, a system used to control the temperature in a space as well as humidity and quality of air. In a big building, the system needs to be able to function based on comfort need as well as meet the size of the space. The HVAC system must transfer heat and moisture into and out of the air to control the temperature level, as well as the level of air pollutants. This is done by removing the pollutants directly or by diluting them. 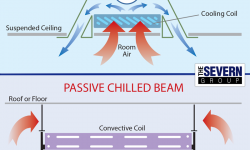 Chilled beams are often compared to a chilled ceiling though there is a distinguishable difference between the two. A chilled ceiling will use pipes with water flow as a chilled beam system. However, the pipes of the ceiling will be placed behind metal ceiling plates. Then, the plates are heated or cooled based on the method of convection rather than the pipes providing the heating or cooling method. Data centers and IT rooms are becoming an integral part of businesses across the globe. And, as technology continues to change and evolve, computing equipment is being created in smaller sizes. However, the smaller size uses more electricity and can generate more heat, which creates a need for heat removal. So, it is essential that such spaces have precision cooling and heat rejection equipment in order for the equipment to stay at an even temperature and avoid overheating. There are several heat removal methods in which cooling equipment can be used to mediate the high heat generated by the computing equipment.